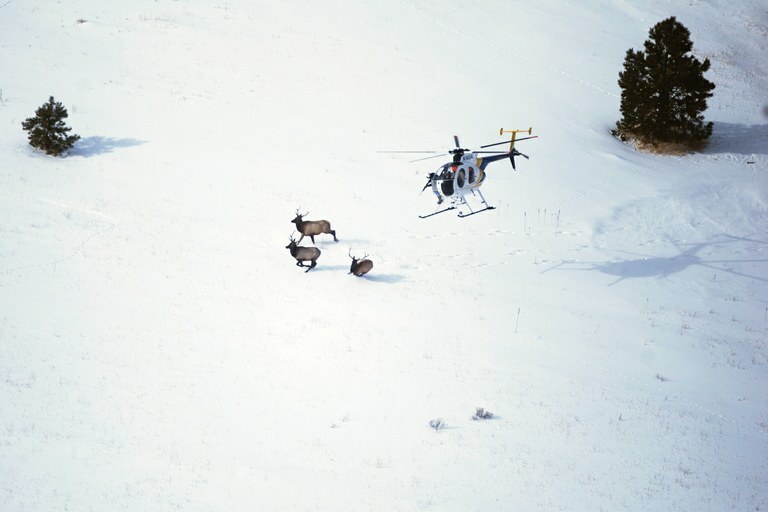 A helicopter chases elk to radio-collar them in order to help improve management in the north Sapphire Mountains and the rest of Montana. The North Sapphire Elk Research Project collected information on elk movements and habitat use, forage quality and other factors that potentially affect elk distribution and migratory behavior. Craig Jourdonnais spots the elk herd within minutes of driving onto the MPG Ranch in the Bitterroot Valley south of Missoula, Montana. It’s a blustery December morning and the fresh-fallen snow on the mountainside provides a stark contrast to the animals’ two-tone tawny coats. He pauses to watch the 200-plus herd for a moment, then eases his pickup into gear to get a closer look. Elk are a familiar sight for the wildlife biologist and former game warden; he currently works for the MPG, managing the hunters the landowners allow in, as well as the elk when they’re on the 10,000-acre ranch. Elk are thriving in parts of the West, and many states have areas where the populations surpass wildlife managers’ goals. Warmer-than-average winters during the past 30 years, combined with good forage and safe havens, mean that more calves survive to breeding age. In Montana, elk numbers grew from 65,000 in 1990 to 160,000 in 2015, despite the reintroduction of wolves. Hunting is the main tool for keeping elk in check, but as large ranches once open to hunting are sold to people who may prefer watching wildlife to hunting it, this management tool is becoming less effective, while elk numbers continue to grow. That’s frustrating for Montana hunters, most of whom fail to harvest their yearly elk for a variety of reasons. It’s also frustrating to longtime ranchers who allow hunting: The elk move to safer havens during the five-week big game rifle season, and then return to nibble ranchers’ haystacks for the rest of the winter. To reduce elk numbers, in 2016, Montana wildlife managers instituted the longest and largest hunting season ever offered in the state — “shoulder seasons” running from August 2016 to February 2017, flanking the regular five-week rifle season in October and November, in about one-third of its hunting districts. That will work, though, only if the elk are on property where they can be hunted. During the shoulder season, that’s mainly private ranches. “If you have five properties and four are wide-open for hunting and one is limited, the elk will find out where that boundary is,” says Jourdonnais. 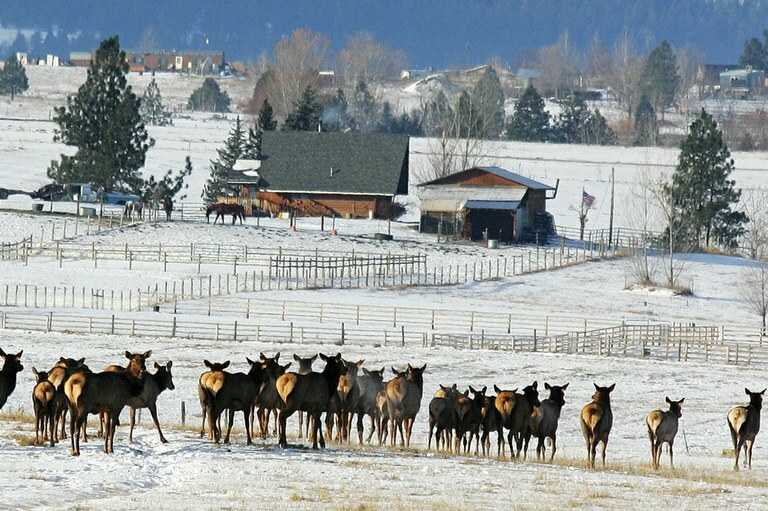 A herd of elk finds safety in pastures near Stevensville, Montana. The elk have learned to stay near towns or subdivisions where they can’t be hunted, and have damaged some fences and haystacks. In the 1600s, an estimated 10 million elk roamed the North American continent. Their numbers plummeted with unregulated hunting, competition for grass from domestic livestock and habitat destruction. By the 1890s, there were fewer than 100,000 elk. Their numbers rebounded through wildlife management efforts, growing to more than 1 million by 2009. That rebound is a success story, and yet too many elk can cause problems. In Yellowstone National Park, they damaged river bottoms by stripping away the willows, aspen and cottonwoods, until reintroduced wolves curbed their numbers. In Wyoming, burgeoning herds crowd into artificial winter feeding grounds, spreading diseases like brucellosis and chronic wasting disease. He ticks off the issues on his fingers. Family ranches are sold to out-of-state corporations, so hunters no longer develop trusting relationships with ranch owners, and fewer hunters are allowed on the land without paying for the privilege. But if private lands are opened only to paying hunters, it puts a monetary value on elk, essentially privatizing the public wildlife. Meanwhile, hotter, drier summers lead to more intense wildfires, which change forage conditions on public lands, limit food and drive animals to private irrigated fields. And politicians who lack wildlife-management experience institute laws that tie biologists’ hands. But 85 percent of Montana hunters with elk tags don’t fill them; the elk may be on private land where they can’t be shot, or the hunters may be using all-terrain vehicles, which tend to spook the animals, rather than hiking into the backcountry. Even in the best situations, getting an elk isn’t easy. “Elk are smart. They’re an intelligent game animal that knows the country,” says John Vore, Montana’s game management bureau chief. In 2015, wildlife managers tried a new “shoulder season” plan in five hunting districts where populations were too high. It was considered a success, with an additional 643 elk taken during the extra season and the dispersal of large herds. In 2016, wildlife managers increased the number of hunting districts participating to 43 of the state’s 138. Montana’s shoulder-season hunts are mainly on private property where landowners already have allowed some type of public access during the regular season. Those landowners can set limits on who can hunt on their property and how many elk they can harvest. The rub is that for the shoulder season to work, the elk have to stay on those properties. But landowners can’t use artificial means, like salt blocks or fences, to encourage elk to stay. So managers try to trick the elk by hunting in one area but not another, then switching it up. Hunt some days, and not on others; make the elk think the season is over, when it’s not. “The best way to hunt elk is with the least amount of pressure,” Galt says. On the MPG, as on many of the state’s large ranches, elk wander on and off the unfenced property at will — and they seem to know when hunters are after them, says Jourdonnais. Radio collaring, used in a Fish, Wildlife and Parks study a few years ago, showed that the night before the general big game rifle-hunting season opened, the elk moved from the MPG Ranch to a neighboring one, where little, if any, hunting takes place. Elk experts theorize the increase in humans gearing up for hunting season — scouting game trails, setting up camps, sighting in rifles — alerts the animals to the upcoming danger, prompting their move to safe havens. The shoulder season is meant to add a bit of unpredictability. Vore says it’s too soon to know the results; the hunters won’t be surveyed until after the season ends Feb. 15. Anecdotally, though, he’s hearing that this winter’s deep snow made it difficult for hunters to reach any elk, and some landowners have not been cooperating. Plus, most of the elk left the MPG Ranch during the shoulder season; they seemed to have learned that if they move near towns and subdivisions, they won’t be shot. Eve Byron writes from Helena, Montana, and often covers natural resource topics.